At the moment, we are in the deep-end of swim team season. I have 4 of my children swimming on the neighborhood swim team and it's going remarkably well. It's nice to have a sport where they practice either together or right after each other and then all the same competition event on the same evening. Our family never did swim team with my older 4 but after a friend of mine who has 7 kids encouraged us to try it, I have become a fan. It really is a great large family sport. Well, this past week at the swim meet I was cheering on my precious children as they swam their hearts out racing to get to the other end of the pool. As I was yelling words of encouragement with all the other parents, tears welled up in my eyes. I was so proud of them, whether they won or not, just for going for it and just for getting to the other end of the pool. I wanted them to hear me and feel me there right along with them. It reminded me of how our heavenly Father is cheering us on. How we have angels and "a great cloud of witnesses" cheering us on. They are watching us on the "side-lines" and they know we can make it. You know, God is really for us. He wants us to finish strong. Just like a loving parent, He is yelling at us not to give-up, to do our best, to push on. I know the love and pride I feel for my children is just a glimpse of what He feels for us. I hope this encourages you like it did me. Sometimes we think God is just making things hard for us, or isn't really watching us or has forgotten us. But just as a mother or father rushes to the side-lines to get a glimpse of their swimmer or runner or soccer player and holds their breath as they watch them push to the finish line, God is there with us cheering us on! 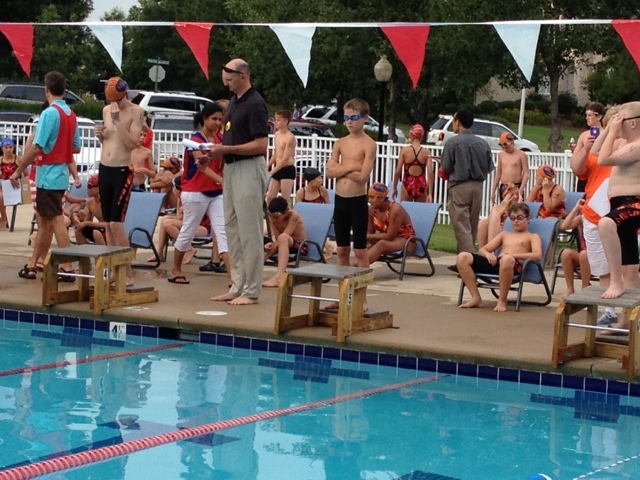 My Luke getting ready to swim a main event. Can you tell he's nervous? And you know what is the number one thing that slows these kids down, they look at the swimmer next to them to see if they are winning. Boy, this was a lesson to me last night! That is what slows us all down......when we compare ourselves to those around us and start "checking" everyone else out. We need to keep our eyes on the goal, on the Lord, and just push on to the end. We should do our best and not worry about everyone else. I love it. Thank you for the reminders. We've had a long hard year & it's easy to forget that He is cheering. Plus being a swimmer kid & now a mom I can relate to your sentiments in many ways. I'm so thankful fir the years the Lord gave me to spend around you & your beautiful family. I miss you often. A lovely reminder for me, and others who are in the Mom Mom stage of life. "If God be for us, who can be against us." Thank you for your encouraging words. It was a reminder I needed today. Beautiful post! I never really thought of it this way, as God cheering us on, but of course you're right, He is. Have a lovely day. 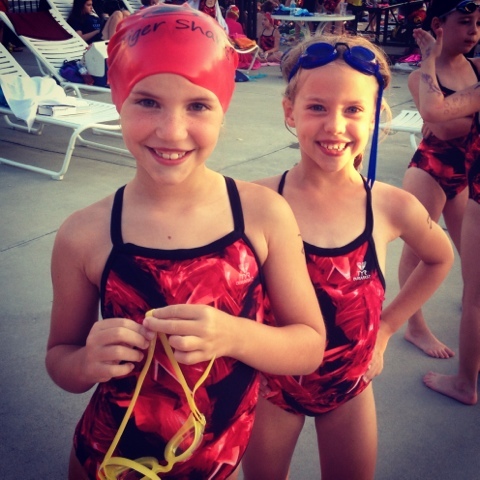 I loved when my children were doing swim team. It was my favorite out of all the sports. And the fact that they did it together was wonderful!